There was a time when a mirror was my best friend. I used to exercise constantly and enjoyed observing better muscle definition or slightly bigger biceps. These days, I’m not as enthusiastic about looking in the mirror. As I’ve grown older, I have added a few (well, maybe more than a few) pounds. I sometimes consider lazily following a fad diet from my couch, but I know the only way to achieve long-lasting results is by shifting my normal routine because optimization requires additional time and effort. Similarly, if space optimization is your main objective for board design, you should consider changing your normal routine and implementing via-in-pad routing. This can provide up to 50% more space for component placement as compared to other options for the same surface area. However, like the additional resources involved in achieving a beach body, PCB manufacturing with via-in-pad routing may involve additional time and cost. 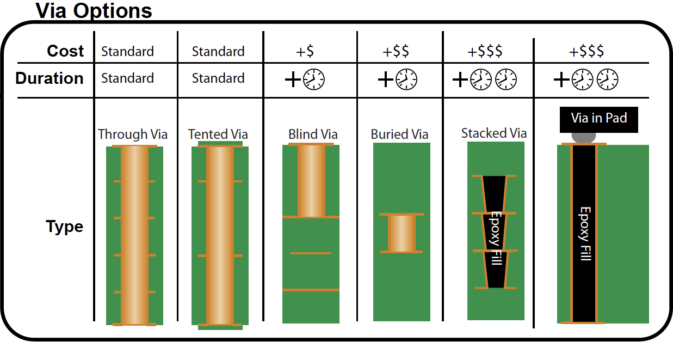 Despite the variety of routing options available, getting the necessary miniaturization results may add time and cost to the PCB manufacturing process when SMD via-in-pad routing is involved. This is especially true for ball grid array (BGA) or chip scale package (CSP) IC components, due to their extremely small size. Before discussing via-in-pad guidelines to minimize additional cost and turnaround time, however, let’s discuss whether or not via-in-pad should be used for your SMD routing and explore why via-in-pad is the best choice when space is limited. Should I Use Via-in-Pad Routing? The most compelling reason to use via-in-pad routing for your SMDs is space. Either your board size is limited, surface routing options are restricted or your design components have very small connection points (pads or balls) and other routing options are inadequate to accommodate your need for reduced space. Although size requirements alone can be compelling enough to consider via-in-pad routing, there are other advantages for your board as well. Compared to other options, via-in-pad involves easier routing for big or fine pitch BGAs (which can be smaller than 0.75mm). Without surface routing from your SMD, you can place bypass capacitors very close to the components, minimizing inductance. This is highly recommended to promote better thermal management. There is no need for via-plugging (i.e. sealing open vias that may draw solder during assembly) since the vias are located directly under the component. Via-in-pad routing is also helpful for high-frequency component grounding. Covering or capping the vias with copper. Capped vias can blow off due to thermal expansion or “out-gassing,” which is caused by the transition of liquid or moisture to vapor form as a result of heating during the soldering process. Another potential problem is the formation of voids in solder joints due to air bubbles migrating upwards through vias. Considering the extra manufacturing cost and time for via-in-pad routing, if you prioritize speed over size reduction for your boards, then you should explore an alternative for your SMD routing and apply techniques to reduce manufacturing time for via routing. Instead of via-in-pad routing, you may opt to use vias between pads, which require more space. You may also consider capping or plugging the vias during fabrication, which will reduce the temperature impact within the via during assembly. However, the caps must be flat for proper SMD placement. Finally, instead of using a through hole, you may choose to use micro-vias, which don’t penetrate the entire board. However, if none of these alternatives suffice and size reduction remains your overriding concern, choose a manufacturer capable of optimizing your board size with via-in-pad routing. Use the smallest via diameter possible. Note that some manufacturers may be limited by their milling equipment. Laser drills are the best for small holes due to their low aspect ratio ≤ 5:1, but hole placement is usually limited to near the edge of the board. Follow the component manufacturer’s recommendations for component placement and via capping or filling. Use micro-vias that only go through one layer of the board. Have your fabricator cap the underside (non-component side) with solder mask. Never leave vias open unless it’s completely unavoidable! Leaving vias open exposes the inner copper to the elements and oxidation, which can shorten the life cycle of the PCB. Much like the naysayers who discourage you from walking that extra mile or performing more reps at the gym, some PCB manufacturers might attempt to discourage you from using via-in-pads for your SMD routing due to the extra time and work involved. However, if via-in-pads makes the most sense for your design and size reduction is an utmost priority, you shouldn’t shy away from complexity. Instead of listening to naysayers, you should find a contract manufacturer (CM) that will embrace the challenge and help you implement good via-in-pad guidelines that include following drill hole rules. 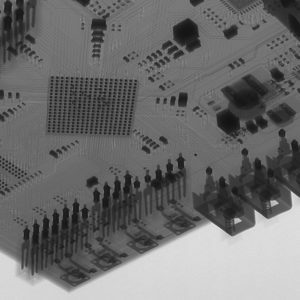 With the right CM on your team, you can achieve the PCB size that your design and customers demand. Tempo Automation is the industry leader in fast, precise and transparent turnkey PCB manufacturing. We have the expertise and capability to build your boards with any SMD routing option you choose. We will support you throughout your product development process, beginning with design and assist you in applying the best DFM practices, including via-in-pad routing guidelines, to ensure that your boards are built quickly and efficiently. If you’re an Altium user, you can easily view and download DRC files that can be added to your PCB design software.If you are ready to have your design manufactured, try our quote tool to upload your CAD and BOM files. If you want more information on via-in-pad routing or need help determining the best SMD routing option for your PCB design, contact us.